A record is any recorded information in any physical format or medium created or received by an organisation during its course of official business and kept as evidence of policies, decisions, procedures, functions, activities and transactions. Records are valuable resources of the Government to support evidence-based decision-making, meet operational and regulatory requirements and are essential for an open and accountable government. Good records management enhances operational efficiency and effectiveness while minimising costs. Records management is therefore an important function of Government bureaux and departments (B/Ds). The Government is committed to identifying and preserving government records having archival value so as to enhance public awareness of Hong Kong's documentary heritage. Management of Government records and archiving of public records are currently regulated under an administrative regime, in which the Government Records Service (GRS) is the central records management and service agency of the government under existing framework. Heads of B/Ds should accord appropriate priority and resources to implement a proper records management programme throughout their organisations. B/Ds should also cooperate with GRS to ensure proper preservation of records and materials with archival value. It is government policy that each B/D should establish a comprehensive records management programme for proper management of government records. To help improve B/Ds' records management, the Government has issued Circulars and Circular Memoranda on the subject which are supplemented by a series of publications and guidelines promulgated by GRS. This includes the introduction of a set of mandatory records management requirements in April 2009. The mandatory requirements cover a wide range of records management activities, including proper management of e-mail records, records classification, records disposal (including destruction of records subject to prior consent of the GRS Director and transfer of records having archival value to GRS), proper custody and storage of records, and protection of vital records. 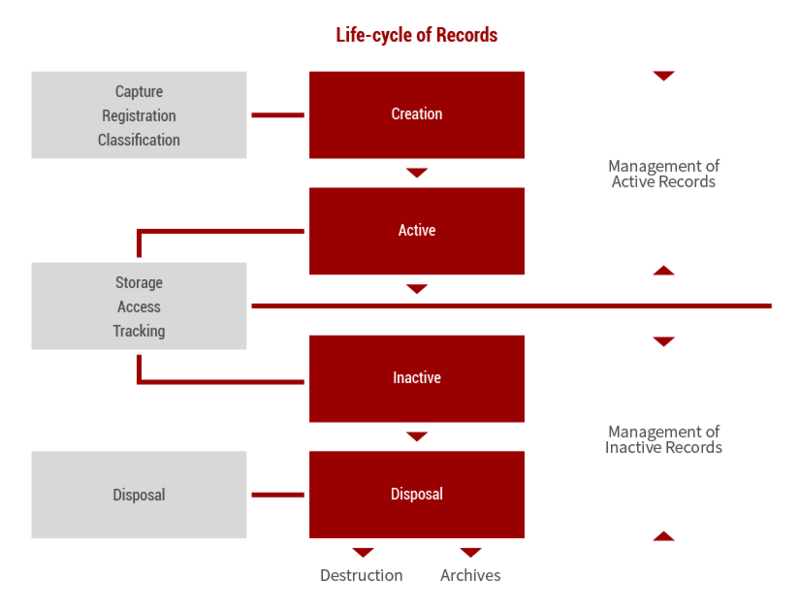 The records management processes in different stages of records life cycle include records capture, registration, classification, storage, access, tracking, and disposal. The key activities include setting records management policy, assigning responsibilities, establishing and promulgating procedures and guidelines, as well as designing, implementing and administering recordkeeping systems. In light of the increasing use of electronic exchanges for official transactions, the Government is pursuing the development of electronic records management to assist in managing both non-electronic and electronic records in an integrated and consistent manner. To ensure uninterrupted operation of major functions of the Government, B/Ds should also identify and protect their vital records (which are records containing information essential to the continued and effective operation of an organisation during and after an emergency or disaster) by establishing and implementing a vital records protection programme. Government records and materials appraised as possessing historical value by the Public Records Office (PRO) of GRS will be transferred to and preserved in GRS' archives repositories. Archival records, upon transfer to GRS, will be arranged, accessioned and described. This will allow users to subsequently trace the needed information via GRS' online catalogue. The holdings of PRO are preserved for use by scholars, researchers and the general public.